A few weeks before the end of the school year, my painting teacher, Ms. Cales, announced an opportunity to help paint a mural for the Temple City Library. Ms. Cales told us that she was going be the head of a committee that would help bring art back into the community. And they wanted the art to be done by the high school students. At the first meeting with the committee, Katherine Keelin from the Temple City Public Advisory Art Group said she hoped this mural would be the first of many for the library. 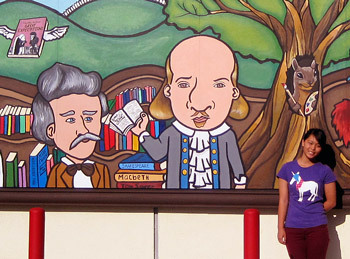 The committee was thinking of a giant mural, consisting of four panels, to hang on the side of the Temple City Library. The mural would be close to eight feet high by 30 feet wide and would be changed every six months. At that meeting we also met Art Mortimer, a professional muralist who offered assistance. I was excited to be a part of this project because there isn’t much to see along the street where the library is besides the bridal shops and Chinese restaurants. There’s nothing for the public to enjoy and most of the buildings are brown or yellow. I liked the design for the mural, which showed scenes from famous books and authors’ faces, but I wished that I gotten a chance to help in the design process. I’m hoping that if the committee can raise funds to replace the mural in the next few months, I will get the chance to give something of my own to Temple City. I was born and raised in this area, and I have a lot of pride in the city. The design, which was done by three incoming sophomores, includes The Emerald City from The Wizard of Oz, a volcano from Dr. Seuss’s Oh the Places You’ll Go and the faces of J.K. Rowling, Mark Twain, Stephen King, Amy Tan and William Shakespeare and the books they wrote. I thought that people passing by would enjoy figuring out who was who and who wrote what book. The design was originally drawn on two pieces of plain white paper taped together. Art suggested that we bold the outlines more and vary the colors for more contrast. We agreed to meet Monday, June 27 to begin work on the mural. When we started working, the students, all from Temple City High School, were eager to jump in. Surrounded by about 20 student artists just as skilled and excited as I was, the mural did not seem that daunting. The first task was to sketch out a rough outline of the design on the mural. This took us two days. Following Art’s advice, we decided to transfer the design to the mural by using a measured grid drawn using a snapline, which is a chalked string used to draw straight lines on a large surface. At the end of the sketching session, Art suggested we take a step back and give our opinions on the piece before starting to paint. Some students thought the squirrel in the tree could be changed, the hot air balloon could be moved up, the fence could be evened out, and the book covers could be redrawn. After taking that moment to critique, we finished all the changes that we wanted to make and made sure that the mural was perfect before painting. We then lined the picture in black to begin painting and added color the next day. Before painting, we had a quick lesson with Art on the meanings of value, hue and shades. Value, he explained, is the relationship between light and dark in a work. Hue asks the question, “What color is it?” For example, a color could be olive green or forest green, but the hue of both is just green. Shade refers to how much black was mixed into the colors to make it darker. He felt it was important for us to know the difference and to begin using this special art terminology when referring to the art. Even though I have been drawing and painting for more than 10 years, I was happy to start talking like a practiced artist. While Michelle worked on parts of the entire mural, she spent most of her working on this portrait of William Shakespeare. Once we began painting, I chose to work on Shakespeare, the tree leaves and the hills. Although we all worked on every part of the mural, I spent most of the time working on these two. Many authors had to be repainted several times to get the right color. Fortunately, mistakes could easily be covered with paint or spray. We finished the mural in a week and a half. And we found out that that there would be a plaque next to the mural with all our names on it. On July 27, we stood around the library, anxiously waiting for the unveiling. The mayor of Temple City began by introducing the idea behind the project and everyone involved. The Public Advisory Art Group stood in front of the mural waiting for the signal to pull the tarp off the picture. We counted down from five, and everyone clapped as the tarp fell to the ground. It seemed as if the crowd liked the picture, and I overheard parents guessing who was who and who wrote which book. I was excited to see whether people would understand what we were trying to do and nervous to see whether they would like it. I was happy especially when I drove or walked by, and I saw mothers with their children or couples stopping to look. Being a part of a community project like this was a very fulfilling experience. I got to meet other students and artists at the high school that I probably would have had no other opportunity to meet. We worked together on something to better our city, and I feel proud to have been a part of it. I hope to get the chance to work on the second piece the next time they change the art.